IntegraStudio also makes use of configurations and platforms, which are standard Visual Studio concept available for all projects kinds. This abstraction is however foreign to Java build systems like Ant or Maven. Therefore IntegraStudio provides configurable mapping between Visual Studio's configurations/platforms and Maven or Ant's facilities. For Ant projects: you can specify default targets to be run on build, clean, deploy and other actions for each configuration/platform pair. 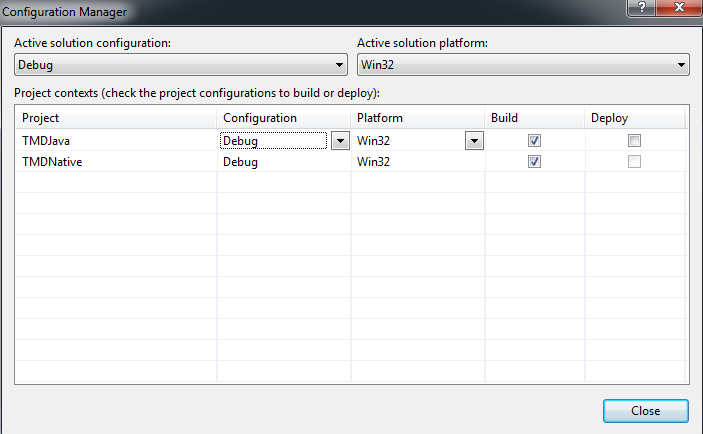 For Maven projects: you can choose a profile (or set of profiles) to be activated for each configuration/platform pair. You can also specify default goals to be run on build and clean actions. All debugger options (regardless of project type) are also stored per configuration/platform pair. There are two ways to select current configuration and platform. Both are generic Visual Studio features and you are likely already familiar with them. The selector boxes select the solution configuration / platform to edit. By clicking on the list, you can specify corresponding project configurations and platforms. This is done exactly the same way for IntegraStudio projects, as for any standard Visual Studio project type (e.g. C++ or C#). You can find a description of these options in this section. Creating new platforms for IntegraStudio projects is different than for regular Visual Studio projects. For the latter ones, the set of available platforms is predetermined and you can choose only among these. 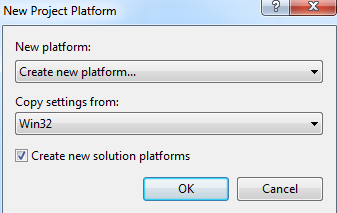 For IntegraStudio projects, you can add arbitrary platforms same way as configurations. Your platforms may match platforms for native projects (if you develop mixed Java/native projects) or can be used for other purposes. It is up to you, IntegraStudio does not force any specific approach to platforms. The standard Visual Studio window will appear. Leave Create new platform... setting in the upper selector box, choose the source platform to duplicate and click OK.
Another window will appear, asking you for the name of the platform. Enter it and click OK.